This is Chalkie. 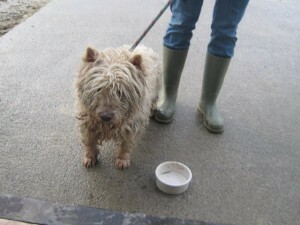 He is a 3-4 year old male Westie. 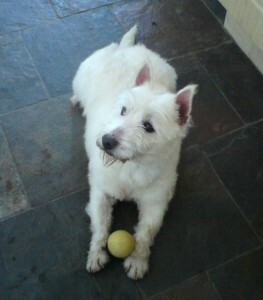 Westie Rescue took him out of Co. Meath dog pound on February 12th 2010. We get a lot of really dirty, smelly, neglected Westies in every year, and we take great pride in cleaning them up and getting them ship-shape again. This can take a lot of effort and patience, but it’s always worth it to see a happy, comfortable, frolicking Westie at the end of it! However, when it comes to a dirty, smelly, neglected competition, poor Chalkie probably wins the title. Not only was his coat horrendously matted, damp, and uncomfortable, but he had some very painful medical problems which only became obvious in the process of his big clean-up. Chalkie had a really bad infection in both ears, which were filled with pus. We cleaned them out and started treatment immediately. He also had ingrowing dew claws (please, all dog owners, keep an eye on these claws, which grow on the inside edge of the front legs: in long-haired breeds it might be easy to forget they’re there). We’ve had Westies in with ingrowing dew claws before, but never before had we seen them not only growing in, but growing back out the far side too. Ouch. I cannot begin to imagine how sore this must have been. Needless to say, his legs were infected. We got him on treatment for these too, straight away. But worse was to come. 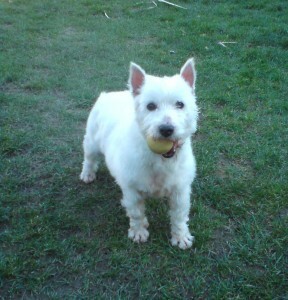 Chalkie on his big rehoming day on March 7th 2010, complete with customary tennis ball in gob! Chalkie allowed us to remove those painful dew claws, to clip all those matts off, to clean his ears… but when we tried to clip around his groin area, he shrieked with pain. We were really upset that this little fella was in distress, so we got him straight to the vet. An inguinal hernia was diagnosed, which essentially allowed one of his testicles to develop in the wrong part of his body: it is a rare condition in dogs, it tends to be more common in humans! Humans describe the conditon as being excruciating when pressure is applied and sore at all other times. Our vet felt that Chalkie had had this condition all of his life. So poor Chalkie has been in pain all his life. Yet he remains a cheerful, happy, friendly fella. He was neutered straight away and the hernia mended. Well, the next few days were a revelation! Chalkie spent a day or two recovering from his operation, but once he was back on his feet, he remembered that he’s a young dog, and he burst into life! He revealed himself to be fun, funny, playful, full of character, gentle, kindly, just a wonderful, lovely dog! In fact, we believe that Chalkie is such a special dog that he was bound to find a very special new home to live in, where he’ll never know another day of discomfort. Chalkie went off on the train with his new Dad last weekend, the 7th of March (myself and Chalkie’s new Dad would both like to thank the lovely ticket inspector on the train who allowed Chalkie to travel with his dad, and not on the baggage carriage! Huh! the cheek of suggesting that Chalkie should travel in the baggage carriage!!!). Chalkie... with a tennis ball again! We don’t believe that Chalkie was necessarily deliberately mistreated. He’s not afraid of people or anything that we do.. in fact, he’s very much at ease with any situation you put him in. We feel that Chalkie fell on hard times through no fault of his own, or indeed perhaps through no fault of his owner. He certainly got himself into a situation where he wasn’t cared for in the past few months, although he didn’t starve as he was sporting a fine layer of insulation! As Chalkie was not microchipped or hadn’t any ID, we could not trace his owner. This, I hope, will serve to remind owners how important proper identification is for your dog. Remember that ID tags can fall off, or be taken off the collar. We encourage all owners to have their dog microchipped, and please, please ensure that the microchip is registered to YOU, with YOUR contact details! Not only can they be used to trace you should your dog go missing, the microchip can also be used as proof of ownership should the dog be found having been stolen.